They say Apple updates its products like clockwork, releasing something new at the same time in the same place every year. Not so with MacBook Airs anyway. The outfit’s gone and freshened up its 13-inch and 11-inch ultraportables — the second such update in nine months. Although the industrial design hasn’t changed much since the last generation, both models step up to Sandy Bridge Core i5 and i7 processors, Thunderbolt ports, backlit keyboards, and, of course, OS X Lion. 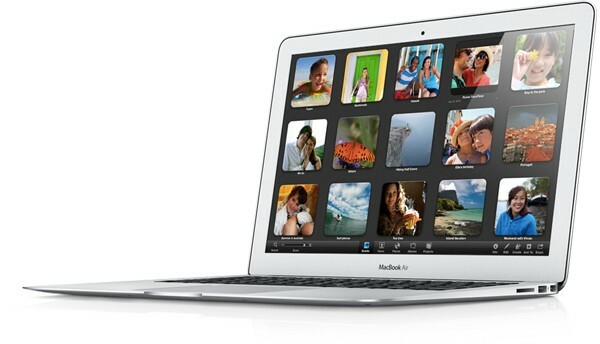 The 11.6-inch flavor starts at $999 with 64GB of solid-state storage, 2GB of memory and a 1.6GHz Core i5 processor. The higher-end of the two configurations costs $1,199, with the extra two hundred dollars doubling your RAM and storage. The 13-inch Air, meanwhile, starts at $1,299, with a 128GB SSD, 4GB of RAM, and a 1.7GHz Core i5 CPU. Step up to the $1,599 model and you’ll get a 256GB SSD instead. Regardless, you’re looking at Intel HD 3000 graphics across the board, along with FaceTime webcams, two USB ports (plus an SD slot on the 13-inch version), 802.11n WiFi, and Bluetooth 4.0. The two differ when it comes to resolution and battery life: the 11-incher has a 1366 x 768 panel and is rated for up to five hours of battery life, whereas the 13-inch model has a 1440 x 900 screen and promises up to seven hours of juice. As for that 1.8GHz Core i7 CPU, it’ll set you back an extra $100 on the 13-inch version, and $150 for the 11-inch version. Whichever size you choose, it’s only an option for the higher-end configuration. Hit the source link to peep the specs and buy one, if you’re so inclined. You are currently reading Apple refreshes MacBook Air with Sandy Bridge, Thunderbolt, and backlit keyboards at Naik Vinay.